Ansell is a Home Counties surname, with a large distribution in Surrey. There are two Ansell men on the South Street War Memorial in Dorking. still a firm of builders called Ansell in the town, and an Ansell Road off the High Street. 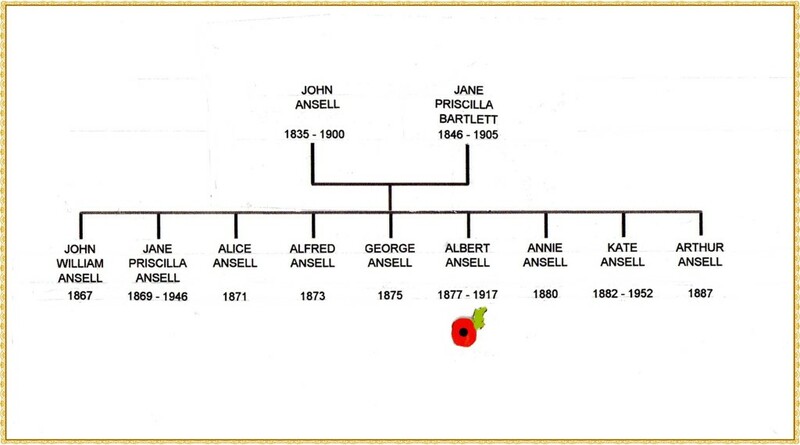 Albert Ansell’s family came from Effingham, but a branch of the Ansells apparently unrelated to him also worked on the Denbies Estate: Richard Ansell was a woodman from Capel, and Albert George (the World War Two casualty remembered also at Ranmore) was Richard’s great grandson. Albert’s father John was born in Effingham, son of (another) John and Sarah Ansell, and baptised at St Lawrence, Effingham on 12th April 1835. He lived and worked on Ranmore Common for most of his life: by 1851 he was a farm servant to a Henry Woods who farmed 60 acres there. He may be the John Ansell who married Jane Priscilla Bartlett in Mortlake Parish Church on 26th March, 1866 (although, if so, it is not certain why either was in that district). By the 1871 census John and Jane Priscilla Ansell are living with three children at the western end of the Common in Hogden Cottage (later called Golden Ring, see Sketch Map for approximate position), John is a garden labourer, presumably in the extensive gardens at Denbies. 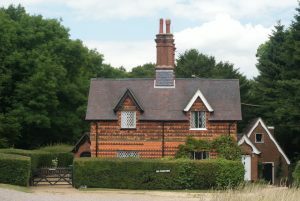 Ten years later in 1881, the family (now including the young Albert) are living close to, but not in, Golden Ring Cottage (maybe in the now demolished Hogden Cottage/Farm). The following year, when his daughter Kate was baptised at St Barnabas, John had been promoted to gardener. 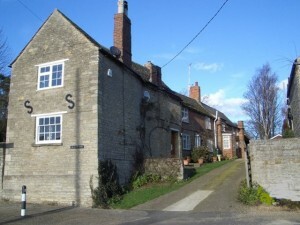 By 1891, John and Jane are at Fox Cottages, and have completed their family of nine children, the older sons working like their father as garden labourers or on the farms. John may have been the “Old Ansell, a man of few words, the master of the flower beds” in Stephen Tallents’ book about Denbies, his grandfather’s house (George Cubitt, the first Lord Ashcombe). Stephen is writing about the 1890s when he was a small boy, so John Ansell would have been in his 60s. John died in 1900 aged 65 and was buried at St Barnabas on 4th December (Grave B4). His widow Jane Priscilla died a few years later in 1905, so neither of Albert’s parents knew of his death in World War 1. Albert’s mother was born about 1846 in either Devon or Dorset (the censuses are unclear). She is possibly the Jane Priscilla Bartlett who married John Ansell, gardener, in Mortlake parish church on 26th March, 1866, although it is curious why the marriage took place near London, unless Jane was under the age to be married without parental consent. If she is that Jane, her father James Bartlett was a carpenter. Jane and John Ansell managed to rear all of their nine children, a fairly unusual feat in the Victorian era. After her husband died, we find Jane in 1901 still living on Ranmore Common, probably still in Fox Cottages. She was buried on 1st September 1905 aged 60 in St Barnabas churchyard (Grave C7). 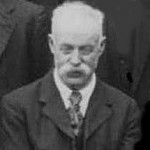 Albert’s siblings were John William (1867), Jane Priscilla (1869), Alice (1871), Alfred (1873), George (1875), Annie (1880), Kate (1882) and Arthur (1887). All were baptised at St Barnabas and went to the School, although with two Ansell families on Ranmore it is sometimes difficult to work out in the school logbook who is who. Most of Albert’s brothers worked on the Estate either as farm labourers or gardeners, but Arthur the youngest was an electrician. Albert’s sisters were either in service or helping at home. According to St Barnabas School Admission Register, John William, the eldest Ansell child, was born on Christmas Day, 1866. He was baptised at St Barnabas on 3rd April 1867. He started at the School in May 1872, his name being one of the very first entries in the Register. In 1878 he failed in two subjects of the school curriculum. The logbook remarks in 1880 that he was “withdrawn to go to work, being 13 years old, and has passed the required Standard, viz. III”. In 1881 John William is living with his family and working as an agricultural labourer, probably on the Denbies Estate. Ten years later, in 1891 he is lodging at Birtley Green, Bramley, and working as a gardener, probably at Birtley Court (House) where Henry Cubitt then lived. At the end of 1895 John William married Kate Plaw aged 24 of Hambledon. 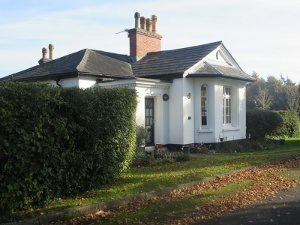 In 1901 they are living at Birtley Green, but by the 1911 census are back on Ranmore Common, living in “Denbies Lodge” (now North Lodge). They have had no children, but Kate’s niece Lena Kate Plaw is with them. Aged 16 and born at Hascombe, she was a housemaid, presumably at Denbies House. During World War 1, Kate is probably the Mrs Kate Ansell who served in Lady Ashcombe’s Needlework Working Party as a VAD (Voluntary Aid Detachment). John William is probably “J. Ansell, Head Gardener” in the 1934 Harvest Home photograph of men with over 20 years’ service on the Denbies Estate. John William and Kate Ansell were still living at North Lodge when she died in 1932 aged 60 and was buried in St Barnabas churchyard (Grave N18). It is not certain when or where John William died. The eldest of Albert’s sisters, Jane Priscilla was born 28th February 1869 and baptised at St Barnabas on 26th May. She started at the School in April 1873, but in 1874 was absent through illness. She had reached Standard IV when in November 1881 she “left to go to the Cottage” (the Dispensary. By 1891 she is working as a domestic servant, probably at Denbies because she is still living on Ranmore Common with her parents and siblings. Most likely she is the Jane Ansell who we find ten years later working as a housemaid in Kensington. Apparently she did not marry, but after the 1901 census she disappears for decades until in 1945 she appears with her younger sister Annie on the electoral roll in Rushett Common, Surrey. She died a year later aged 77. Alice, the next sister, born on 6th January 1871, was baptised on 3rd May. 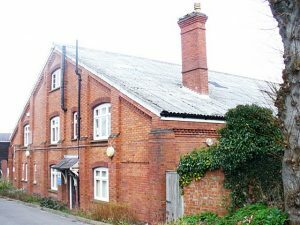 She started at St Barnabas School in April 1875: in October 1883 the logbook remarks that all the pupils were present “except for Alice Ansell and 2/3 very little ones who had only just been admitted”. The same month, Alice left school, having reached Standard V. Like her sisters, she seems to have worked as a housemaid until in 1897 she married Samuel James Schofield in Wandsworth. He was a gardener, born in Ringshall, Suffolk around 1877. In 1898 his sister Fanny married Alice’s younger brother Alfred. In 1901 Alice and Samuel are living at 20 Burritt Road, Norbiton (part of Kingston, Surrey). Samuel is working as a general labourer, but by 1911 he is once again a gardener, and the couple have moved to the village of Tansor, near Oundle in Northamptonshire. They have no children. Samuel could have fought in WW1, but there is no obvious candidate. 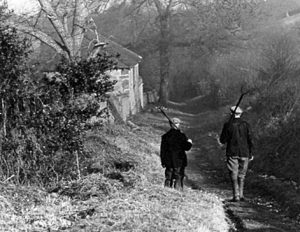 It is not certain when Alice and Samuel died, although it is possible they moved south again towards the end of their lives. The second Ansell son was born in 1873 on 12th March and baptised at St Barnabas on 25th June. His name seems to have been omitted from the School Admission Register, but the 1884 logbook says he failed in two curriculum subjects and in March 1885 he “left school to go to work”. By 1891 he was still living with his family and working as a gardener, probably at Denbies, but in 1898 at St Peter’s Norbiton, Surrey he married Fanny Schofield, sister-in-law to his sister Alice. Fanny had been born in Ipswich, Suffolk about 1870, the daughter of Samuel Schofield, carter. By 1891, the Schofield family had moved to the Effingham end of Ranmore Common and Alice was a dairymaid, possibly on the Dunley Hill Estate if not at Denbies. 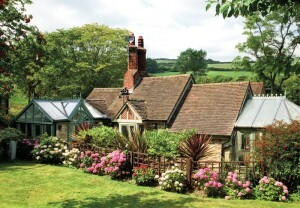 Luccombe Chine Lodge today (photo courtesy of www.seaviewisleofwight.co.uk). By 1901 Alfred and Fanny have migrated to Bonchurch on the Isle of Wight and are in Luccombe Chine Lodge, probably because Alfred was a gardener in the extensive grounds of Luccombe Chine Court, a splendid Edwardian manor house with sea views down picturesque Luccombe Chine. Ten years later Alfred and Fanny are still at the Lodge and have not had any children. There is no obvious record of any WW1 service for him. Fanny died in 1926; he is very probably the Alfred Ansell who died in the Isle of Wight in Mar qtr 1950 aged 77. The Ansells’ fifth child was born on 3rd April 1875 and baptised at St Barnabas on 21st July, He started at the School in May 1878, reaching Standard IV before he left in May 1887 “to go to work”. His original job was farm labourer, but by 1901 he was a woodman. He may be the “Mr G Ansell” on the 1903 Golden Wedding Anniverary scroll for George and Laura, Cubitt, Lord and Lady Ashcombe. 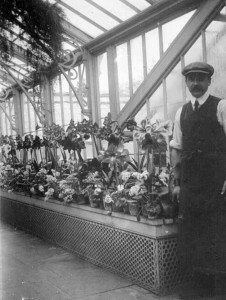 By 1911 he had become a gardener and was living on Ranmore Common, with two other unmarried siblings Arthur and Annie. After that George Ansell is difficult to trace. It is not clear whether he served in the Forces. From 1920 for a few years a George Ansell is living at 15 Myrtle Road, Dorking, with a Sarah Ansell, but whether this is the correct George has also been difficult to ascertain. Sarah’s name disappears in the 1930s and a George Ansell lives in, variously, 8 Chalkpit Cottages, 31 Ashcombe Road and 10 St Martin’s Place. The last obvious electoral entry is in 1938, but again a death has not been found. Albert, of the War Memorial, fits in here in the family order, born in 1877 on 6th February and baptised in St Barnabas Church on 2nd May. See his page for more details of his life and death. Annie, born 2nd March 1880 and baptised 26th May, started at St Barnabas School on 28th April 1884. The following November, she was absent through illness, and in 1891 she failed in two curriculum subjects, so was kept down in the same Standard. However, she was awarded certificates in religious knowledge from the Diocesan Inspections, and she had reached Standard V when, in October 1894, she left school “to be trained for service at the Cottage” (Dispensary). By the 1901 census Annie is living on Ranmore Common with her widowed mother Jane Priscilla Ansell and unmarried brothers George and Arthur. By 1911 Jane Priscilla is dead and Annie is keeping house for her brothers. Then there is a long period when she is very elusive, until in 1945 she is living on Rushett Common with her older sister Jane Priscilla. It is not certain when she died. The youngest sister, Kate, was born 5th May 1882 and baptised 13th July. On 3rd May 1886 she entered St Barnabas School, though she does not feature much in the logbook until in June 1891 she “returned to school after mumps”! She was awarded religious knowledge certificates as a result of the Diocesan Inspections, and achieved the highest Standard VI before she left school at Christmas 1895. On 20th December 1898 she was a witness to her brother Alfred’s marriage to Fanny Schofield. Three years later, in 1901 we find her working as a housemaid in the London home at Brompton of a retired colonel. In 1907 she was a witness to another marriage, that of her brother Albert to Edith Doe in Bramley. 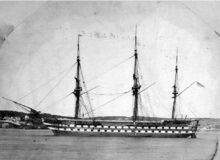 HMS Ganges (which spent many years in South America and, as here, off British Columbia before becoming a training ship). On 3rd June 1909, Kate married Ernest Alfred Keyes at Christchurch Greenwich. He was a Metropolitan Police constable, father George (a brickmaker). Ernest had been born 1884 in Shoeburyness, Essex; in 1901 he was a 16-year-old ship’s boy among scores of other lads on the Royal Navy’s training ship HMS Ganges at Harwich. From 1900 until he left the Navy in 1908, Ernest served in innumerable ships. In 1911 Kate and Ernest, once again a police constable, are living in 119 Lumley Buildings, Pimlico Road, London, with their one-year-old daughter Kathleen Emily. Ernest rejoined the Royal Navy for WW1, but on 26th July 1915 he died from disease, while serving at Portsmouth, actually on HMS Victory ! He was buried in a Royal Naval War Grave in the churchyard of St Andrew’s Shoeburyness, At the time Kate was living at 113 Morland Road, East Croydon, Surrey, and she probably stayed on in Croydon: in 1938 her daughter Kathleen married Reginald Arthur Clack there, and Kate appears to have died there in 1945. The youngest of John and Jane Priscilla’s nine children was born 7th July 1887 and baptised 18th August. He started at St Barnabas School on 20th July 1891, but in November was absent through illness. Otherwise, both the Admissions Register and the logbook are very silent about him, only that he achieved Standard 1, with no leaving date given. However, he was obviously talented since he became an electrician working at Denbies for the Hon. Henry Cubitt. No doubt encouraged by his military-minded employer, in 1909 Arthur enlisted in the Territorials, signing on for four years in the 5th Battalion, The Queen’s (Royal West Surrey Regiment). Each year he did a fortnight’s training at various army camps around Sussex. Arthur must have married at some time because he was a widower when he re-married in 1935. His bride, seven years his senior, was Mary Reid Simpson, a domestic at Denbies House. They married at St Peter’s Church in the suburb of St Helier near Sutton. 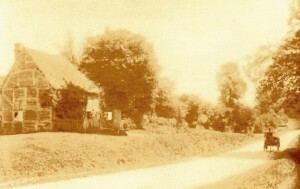 Arthur gave his address as 306 Glastonbury Road, Morden (or perhaps Sutton, Surrey, see below) and his profession as Railway Police Constable. Arthur and Mary stayed on at 306 Glastonbury Road until he died on 25th January 1959. Apparently born 20th May 1878, Mary seems to have been one hundred years old when she died in Sutton in the June quarter of 1978. This is a composite list of the sources consulted for all members of Albert Ansell’s family, but details for the individual family members are available if required. Virtually all of the sources mentioned can be viewed online via Ancestry, Find My Past and Free BMD.